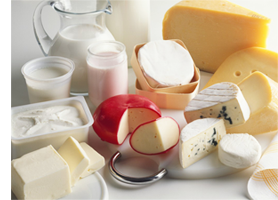 Hofmann heat exchangers can achieve accurate temperature control and improve the quality of dairy products. Shenyang Dairy Co., Ltd. is a wholly foreign-owned enterprise, located in Huishan Economic Development Zone of Shenbei New District in Shenyang City (also known as "Huishan Dairy"), setting high-quality dairy breeding, forage cultivation, forage processing, milk Product processing, sales, monitoring large-scale comprehensive modern dairy enterprises, which is the national, provincial and municipal agricultural industrialization leading enterprises, and the largest liquid milk production enterprises and regional dairy industry leader in Northeast. Dairy processing industry used plate heat exchanger process is mainly pasteurization; in addition another important link is cooling the dairy. Huishan Dairy expects the use of advanced heat transfer production technology and equipment to enhance the quality and production capacity of dairy products, Hofmann (HFM) as an important supplier of heat exchange equipment for dairy products, has provided advanced and efficient heat exchangers for the development of dairy giant. Huishan has invested more to build a variety of dairy cattle breeding and dairy processing industry cluster project in Liaoning province. After years of layout, enterprises has gradually formed the whole industry chain development model, which is based on herbage cultivation, fine feed processing, good breeding of cows, dairy products processing, dairy research and development and quality control. At present, Huishan has nearly 50 million acres of alfalfa grass and auxiliary feed cultivation base, with an annual output of 500,000 tons of dairy cows dedicated concentrate processing plants, more than 200,000 purebred imported dairy cattle, 82 large-scale self-employed pastures and six modern dairy processing production base. Relying on self-employed ranch and the whole industry chain development model, Huishan product matrix covers infant formula milk powder, liquid milk and other product categories. Perfect production management system and advanced technical support, making Huishan products have a higher quality breakthrough and quality assurance. In the daisy dairy industry process, the plate heat exchanger is mainly used for pasteurization of fresh milk, can also be used for fresh milk and dairy products heating, sterilization and cooling. Sterilization and sterilization not only affect the quality of disinfectant milk, but also affect the flavor and color, shelf life. Therefore, the temperature and duration of pasteurization must be accurate. There are many forms of pasteurization: general high temperature short-term pasteurization temperature is usually 75 ℃, usually for 15 ~ 20s; or 80 ~ 85 ℃, 10 ~ 15s. If the pasteurization is too strong, then the milk has a cooking flavor, cream will also produce agglomeration or polymerization. Therefore, Huishan dairy industry choose HFM plate heat exchangers to achieve the precise temperature control for the production chain, so that both can ensure the dairy pasteurization and can improve the quality of Huishan dairy products. Hofmann heat transfer solutions and heat transfer equipment are widely used in the production of dairy products to help our customers achieve higher productivity, higher energy efficiency, higher raw material utilization, less waste and less and to provide consumers with higher hygiene and higher safety dairy products. For a long time Huishan dairy adhering to the corporate philosophy "build a trusted dairy brand”, is dedicated to the whole industry chain development model to explore China's dairy industry, to solve the core issue of dairy products safe from the source, is the first to realize exported from proprietary pasture of large-scale dairy products enterprises in domestic.